At the nearby Dynamite Hill Recreation Area there are a large variety of winter sports available. 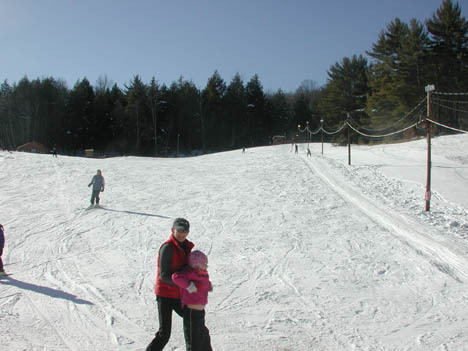 A covered ice skating rink, sledding, snow boarding and downhill skiing with a tow rope, and cross country trails are available free of charge. We are 10 miles to Stone Bridge and Caves, which offers over twelve miles of well marked snowshoe trails. See the largest marble cave entrance in the east. A 14 mile drive takes you to famous Gore Mountain Ski Resort with many challenging skiing, snow boarding, and cross country opportunities. A 3 mile drive to Friends Lake with Cross Country Ski Trails. 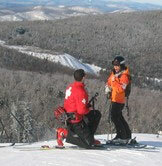 A 1 1/2 hour drive to the Whiteface Mountain and Lake Placid Olympic Region for winter sports. 6 miles to the Winter Carnival on Brant Lake and 15 miles to the Winter Carnival on Lake George from Mid January to Mid February. The Northern Warren Trailblazers Snowmobile Club maintain 80+ miles of groomed trails. You can ride the trail sytem right from our front door. We offer group rates for snowmobilers - Call us for details.